I was already well aware of this and it is the reason that I hold little hope that china is capable of doing the right thing when it comes to pollution generally. Corporate cash flow largely determines access to bank lending and that means that any and all short cuts will be exploited. If that means poisoning the adjacent city, so be it. Worse, there is no mechanism in place able to enforce compliance at all or we also would not be seeing this. As I have posted in the past, there is a better protocol for cleaning up these stacks. However the present regime is an engineer’s dream inasmuch as it is a large capital program. Needless to say nothing is going to change unless China regulates it firmly. Recall that in China, you are finished your career at fifty. Surviving much longer is not a government priority. Cleaning up the air pollution from coal, still leaves the mining deaths, solid and liquid waste, and the transportation deaths. Plus the mitigation technologies increase the operating costs and lower the efficiency of the plants. China continues to build a lot of coal plants and for the last 10-20 years China has built modern coal plants that have the latest pollution mitigation technology. Why did they not turn on pollution control until recent protests about air quality. It would have added over 0.4 US cents per kwh to the costs for one of the technologies and more for each of the other pollution control technologies. China is making about 4000 billion kwh/year of electrical power from coal power. So 0.4 cents per kwh is $16 billion/year. A Planners Guide to Selecting Clean Coal Technologies is a World Bank book that covers the costs and issues for putting in coal plant pollution mitigation. 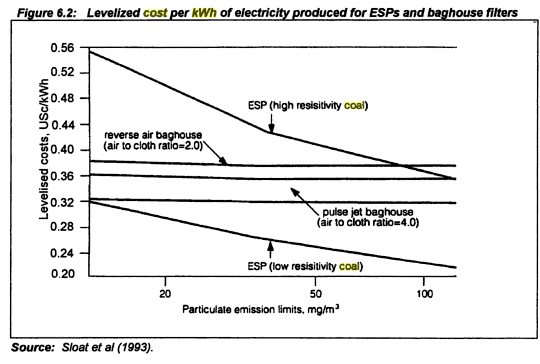 The cost to operate the ESP mitigation (power and plant operation effects is about 0.3-0.5 cents per kwh.) So coal plants electricity costs go up about 10%. This is for just one of pollution control technologies (but the most important in terms of preventing air pollution deaths because particulates are the most deadly. However, you still want to stop the smog and the ozone and the mercury and the 80 other pollutants. The following provides a brief description of 16 clean coal technologies. All but one are in use today at coal-fueled electric generating units (EGUs); carbon capture and storage (CCS) is still under development. 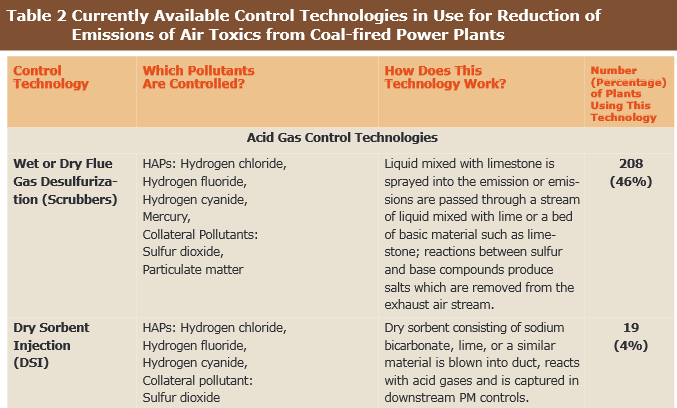 Alone or in combination, clean coal technologies are capable of reducing sulfur dioxide (SO2), nitrogen oxides (NOx), particulate matter (PM), mercury, acid gases, and other emissions from coal-fueled EGUs by 90 percent to 99.9 percent. In addition, the high efficiencies of advanced coal-fueled electric generating technologies contribute to reductions in carbon dioxide (CO2) emissions. Wet scrubbers (or flue gas desulfurization) combine a mixture of lime or limestone and water with power plant flue gases to remove SO2 and acid gases. The mixture is either injected into the scrubber with the flue gas, or the flue gas bubbles up through the mixture. According to EPA, wet scrubbers achieve SO2 and acid gas removal efficiencies of 90 percent to 98 percent. Scrubbers in combination with selective catalytic reduction (SCR) for NOx control can remove up to 80 percent of mercury emissions. Dry scrubbers spray very finely powdered lime or other absorbents into a vessel where they combine with power plant flue gases to remove SO2 and acid gases. The resulting sorbent is captured with a fabric filter (also called a baghouse). According to EPA, dry scrubbers achieve removal efficiencies of 90 percent to 93 percent. DSI systems inject sorbents, such as Trona (a naturally-occurring mineral), into power plant flue gas ductwork to remove SO2 and acid gases. The sorbent is then captured in the PM removal system (either an electrostatic precipitator or a baghouse). DSI systems achieve 40 percent to 75 percent removal. Burners inject coal and air into power plant boilers. Low-NOx burners are designed to reduce the level of NOx formed as the coal is burned. Depending on the burner design, DOE reports that low-NOx burners achieve from 40 percent to 50 percent NOx removal. The removal efficiency of low-NOx burners can be improved by injecting air into the area above the burner. With certain burner types, LNB with OFA can achieve nearly 70 percent NOx removal. SNCR systems inject ammonia into power plant flue gases to remove NOx. According to EPA, SNCR achieves about a 35 percent reduction in NOx emissions. With SCR, ammonia is injected along with the power plant flue gas into a device that contains a catalyst to improve NOx removal efficiencies. According to EPA, SCR can achieve up to 90 percent NOx removal. SCR in combination with SO2 scrubbers can achieve up to 80 percent mercury removal. ACI systems inject finely-powdered activated carbon into power plant flue gases. The carbon is then removed by the PM control system (fabric filter or ESP). ACI can achieve up to 90 percent mercury removal. Halogenated ACI improves the mercury removal efficiency of ACI by adding a halogen (either bromide or chloride). Removal efficiencies of greater than 90 percent have been reported. Fabric filters (also called baghouses) remove PM from power plant flue gases by capturing PM on fabric bags that are analogous to vacuum cleaner bags. The captured PM is removed by injecting high-pressure air into the bags or by shaking the bags. Fabric filters can achieve 99 percent to 99.9 percent PM removal. ESPs capture PM from power plant flue gases by passing the gases through a device in which charged metal plates are suspended. The PM is attracted to the plates by static electricity. 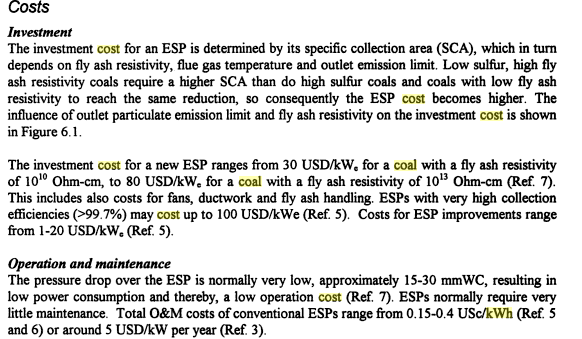 ESPs are classified as either “hot-side” or “cold-side” depending on their location in the flue gas train. According to EPA, new ESPs capture 99 percent to 99.9 percent of PM. A baghouse is installed downstream of an ESP for improved PM control. Additionally, sorbents can be injected to capture mercury, and, in some cases, SO2 and NOx. 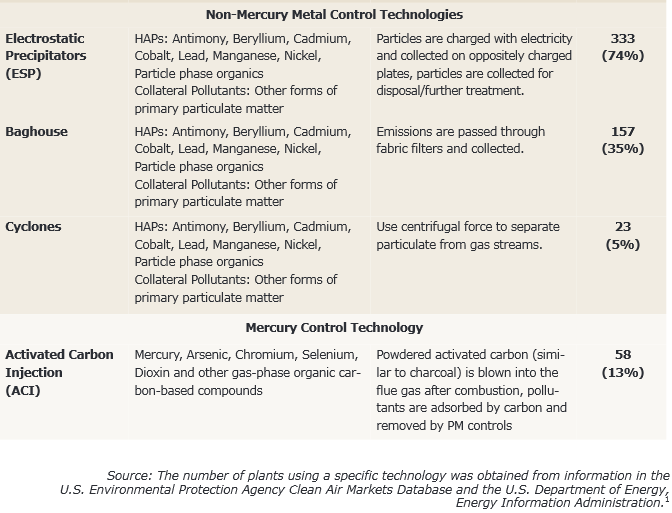 These systems have been reported to achieve 90 percent mercury capture and, in certain cases, 90 percent SO2 removal and up to 30 percent NOx removal. Supercritical boilers operate at higher steam temperatures and pressures and, therefore, are more efficient than subcritical boilers. Supercritical boilers can achieve thermal efficiencies of up to 40 percent, compared with an average of 33 percent for the existing fleet of coal-fueled EGUs. Because of their efficiency, supercritical units can emit 10 percent to 20 percent less CO2 than subcritical EGUs. USC boilers operate at even higher pressures and temperatures than supercritical boilers. American Electric Power’s John W. Turk plant in Arkansas uses USC technology. The plant recently began commercial operation. USC units can achieve up to 44 percent thermal efficiency, resulting in CO2 emissions that are as much as 30 percent lower than those from the existing fleet of coal- fueled EGUs. IGCC converts coal to a synthetic gas that is combusted in a combined-cycle system (a combustion turbine and a heat recovery steam generator). IGCC can achieve thermal efficiencies that exceed 40 percent, thus emitting as much as 30 percent less CO2 than the existing fleet of coal-fueled power plants. IGCC plants also have very low SO2, NOx, particulate matter and mercury emissions. CCS is a technology system to capture CO2 from power plants and permanently store it underground safely in geologic formations. Currently, CCS is estimated to add 40 percent to 80 percent to the cost of electricity generated by a coal- fueled electric generating unit. CCS can capture and store up to 90 percent of the CO2 from a power plant. No full-scale CCS-equipped power plants are operating in the U.S., although several small-scale demonstrations have taken place.